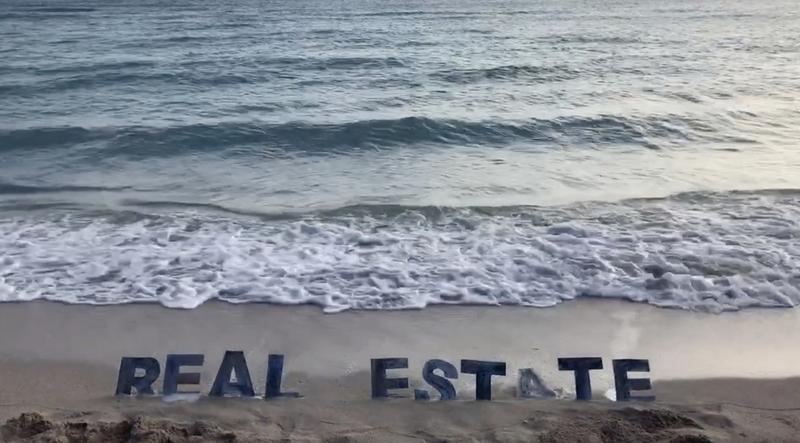 Jillian Mayer, Beach Real Estate, fine by me, 2019, digital video, 4 minutes. Jillian Mayer’s “TIMESHARE” is populated by a mélange of brightly painted amorphous sculptures, the singsong calls of birds, and an absurd array of potted plants, benches, and utilitarian objects, including a coffee mug, a stapler, and a stack of file folders. At first confounding, Mayer’s aesthetic is influenced by survivalist and prepper subcultures, though it does not necessarily offer reassurance. The show opens with the video Beach Real Estate, fine by me, 2019, which is set on the coast of Florida, the artist’s home state. In the foreground, shiny blue cutout letters are stuck in the sand to spell out REAL ESTATE, right on the cusp of the ocean, which fills the rest of the frame. Wave after wave surges over the letters, knocking them all down by the end of the piece. Mayer seems to be wryly commenting on the impact of rising sea levels on the sunshine state. But the second half of the title, fine by me, gestures toward a more sardonic, ambivalent relationship to this impending calamity. As if looking out onto this vista, the benches in the installation suggest that visitors sit down to think through these implications. One such construction, Melting Bench 002 with Chime, 2019 (a collaboration with Rodrigue Mouchez), is made of epoxy resin, fiberglass, foam, plastic, wood, and enamel that all appear to slide off a partially exposed metal frame. Both comforting and unnerving, this seating provides the illusion of support even as it physically wobbles beneath you, its chime tinkling. The proverbial canary in a coal mine, Mayer’s work highlights the apocalyptic connections between our creations and our world.